The Family Quilt | Families are like quilts, stitched together one piece at a time, and the quilt tells a story, one piece at a time. ~ Families are like quilts, stitched together one piece at a time, and the quilt tells a story, one piece at a time. A few years ago, the Fourth of July found us in central Texas, with one thing on our minds – finding the graves of my husband’s great-great grandparents. I had done some research and located them in a cemetery listed as Old Valley Grove Cemetery, near Stephenville, in Erath County, Texas. Squeezing this long-anticipated research trip between hauling loads of hay to Texas, from Colorado, and back again, only gave us about one day to locate the cemetery. We parked the truck, hopped in a rental car, and set off for Stephenville. This was my first time actually traveling to ancestral grounds and locating a cemetery and I was excited to actually be doing something like this, after years and years of researching from my computer at home. 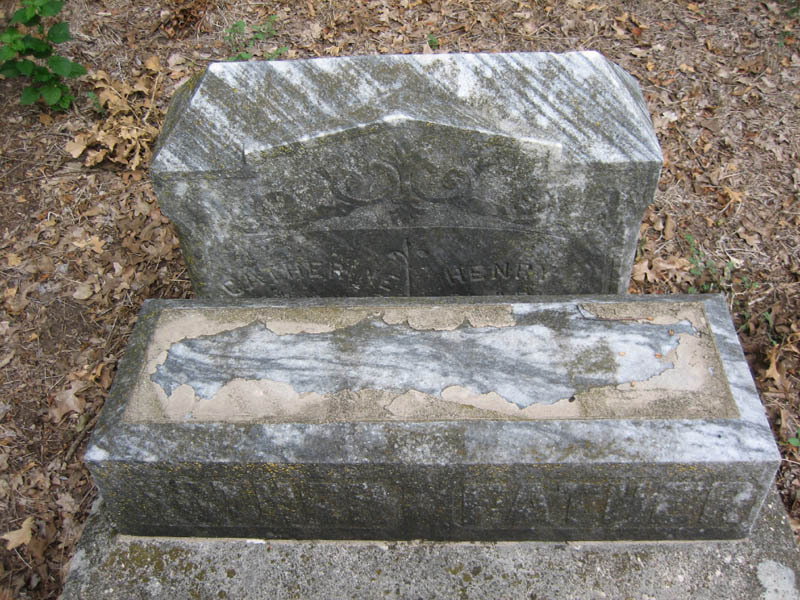 Finding ancestors on paper, or online, and the thrill of putting the pieces together is wonderful, but to actually be driving out and physically locating the cemetery was exciting in a very different way. The drive took about an hour, a nice drive through pretty country. To actually see the country where your family’s ancestors lived and worked, especially back when times were much harder for them than today, fuels your imagination and our thoughts drifted to what it must have been like for them, as we drove through that beautiful Texas countryside. My research had provided me with information that his g-g-grandparents had been instrumental in settling Erath County. His g-g-grandfather, Henry Willis Clark, was born in Arkansas, and Catherine (Danley) Clark, his g-g-grandmother, was born in Missouri. A census record shows her parents and others living next door to Henry and Catherine in Erath County. I am still researching more about their arrival and history there. We arrived in Stephenville and easily found the highway where the cemetery was supposed to be. It was getting late in the afternoon, and we were hoping to find it quickly and get some photos before dark. We drove to the church there with the same name, but no luck on any cemetery there. We finally stopped at a fireworks stand and asked the guy there if he knew where it was. He thought there was one down the road, so we drove back down the road and found a gate with the owners’ names on it, and a sign nearby for the New Valley Grove Cemetery. 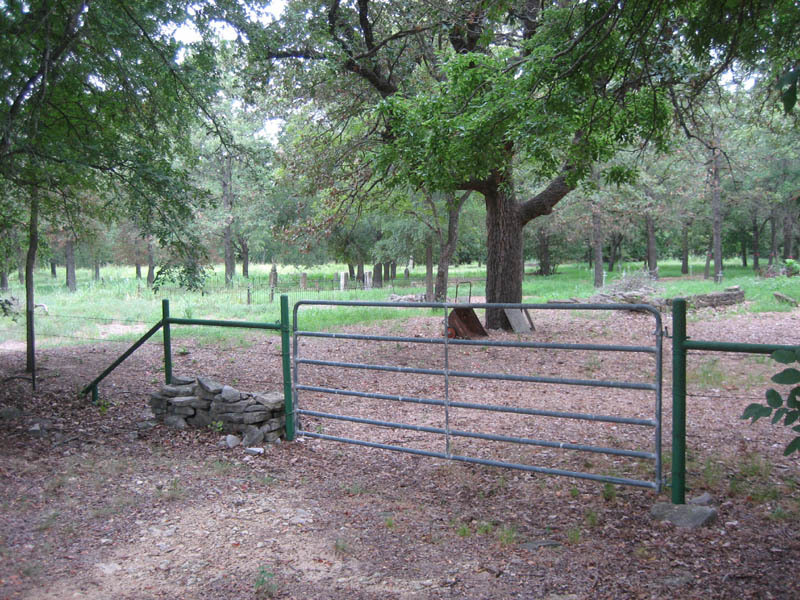 In Texas, it is the law that landowners must allow access to any cemetery that is on their property, or if you need access to said cemetery by crossing their property. (http://www.cemeteries-of-tx.com/txlaws.htm) Such was the case here, so we opened the gate and drove back to the cemetery. The name was ‘New’ and not ‘Old’ Valley Grove Cemetery, so I was pretty sure that it wasn’t the right one, but we walked around and checked names on some of the headstones. There were some old headstones there, but none for his family. Frustrated, we drove out and started up the highway, and a ways up the road we noticed a house with the same name as the owners’ names on the fence around the cemetery. After we passed by, my husband decided we should turn around and see if they might know where the cemetery we were looking for was located. Being the Fourth of July, there was a BBQ going on at the house, and some friends of the family happened to be out front. They had no idea about any cemetery, but thought that ‘Tim, the owner’ might know and went to find him. Tim came out and talked for a minute to my husband. He said he did know about an old cemetery down in the woods across the highway from his house. He offered to lead us down there and show us where it was, so off we went. Sure enough, down the road a short way, and across the highway back in the woods, we came upon a sign for the Old Valley Grove Cemetery. We came to a gate and parked there and walked back into the overgrown cemetery. Tim was surprised that there had been some obvious clean up and restoration going on, he said that the last time he’d been there the owner had let cows graze in there, and there had been gravestones knocked over. Someone, or some group, had marked several graves with white markers and cleaned up a lot of brush. It was a beautiful old cemetery, with a low rock wall running around the exterior, but it still needed a lot more work to clean it up. Tim said that it had been much worse the last time he was there. After walking around for several minutes, and as it was becoming darker by the moment, we finally happened across their headstone, and a brother of Henry’s, John Clark. Henry and Catherine’s headstone top piece had been disconnected from the base, probably knocked over and stood back up, but in need of restoration. It was hard to read, but we were able to make it out. In front of Henry’s, interestingly enough, was a newer marker that identified Henry Clark as a Texas Ranger. I later found out that his service with the Texas Rangers ended before his death date, so he was not killed in the line of duty. Henry died at a relatively young age, but Catherine went on to marry three more times, her last husband being a judge in the county, a William King. As darkness fell the fireflies danced around the cemetery, and we listened as Tim told us that as a young boy he had tromped through these woods with his pistol and played along the little creek that passed through the area, never imagining that he would ever meet anyone who had ancestors in the old cemetery. The kindness of a man who would leave his holiday BBQ and take the time to show us where this cemetery was, and enable us to find my husband’s g-g-grandparents, is not lost on us. It is another kindness we were blessed with and can only hope to repay someday. Another piece of our family quilt, stitched into our memories. I have been a member of Ancestry.com for many years, and absolutely love the discoveries I have found over the years. I had never really done much with the Member Connect part, until a couple of years ago, when I exchanged a message with another member about a common ancestor. We discovered that our great grandmothers were sisters through our paternal lineage. She lives in North Carolina, where our family roots run deep. We kept in touch here and there, and eventually friended each other on Facebook, and got to know each other better. When she first saw my picture, her comment was, ‘You favor the Braffords’, our common ancestors. It took me by surprise when she said that, but it gave me a good feeling to know that someone I had never met could look at my picture and connect us with those simple words. The story goes deeper, and this is what has endeared this cousin of mine to me for life. In the spring of 2011, my husband and I received an opportunity to travel to North Carolina with my husband’s job. We were going to be near where my ailing uncle lived, and I hoped beyond hope that we would be able to somehow find a way to get closer than the 150 miles that separated our delivery point and his home, but that is not easily accomplished in a semi-truck. I also hoped to finally meet my newly found cousin, Virginia, as she had been wanting us to do. I racked my brain trying to find a way for us to get there, and when my last option of renting a car, fell through, I finally accepted that it wasn’t going to happen, and instead, made a phone call to my uncle. We chatted for a few minutes, although he was not up to much talking. He had been in and out of the hospital in recent days, and wasn’t feeling very well. So close, yet so far away. In the meantime, Virginia was trying to figure out how she could come to where we were, but things were not falling into place for her either. It did not seem like it was meant to be for us to meet, this time. We made our delivery as planned and awaited our next assignment for a load. When word finally came through, incredibly, they were sending us to the very town near where my late grandparents were from, a town that lies halfway between my uncle’s house, and Virginia’s house. I let Virginia know that we were coming that way, and she told me she’d meet us at the truck stop near there. We were still going to be a half an hour from my uncle’s house, and still no car to go those last miles to his house, and with him being sick I did not want to impose on his family to come meet us. Again, frustration arose….so close, yet so far away. We arrived at the truck stop, ready but nervous, to meet my cousin. She sounded so nice, but you never know how you’ll get along until you spend time together. Within minutes of arriving, we see her, and greet each other with big hugs. I could see our family resemblance right away, as I gazed into those eyes that looked so familiar. We started trying to decide where to go eat dinner, and in the course of just a few minutes, she assessed the situation, finding out that I was not able to go see my uncle, and offered to drive us up to his house. We protested, but she insisted, and within just a very short time of meeting this dear lady, we got into her pickup and started the drive to his home. Even funnier, us being total strangers to her, she happily gave my husband the keys and told him to drive up there, and she got in the back seat of her own pickup! The generosity of this woman is amazing, and her kind gesture will live with me forever. The evening was wonderful; me seeing relatives that I had not seen for many years, and Virginia meeting more cousins for the first time. That evening turned out to be the last time I would ever see my dear uncle, my dad’s youngest brother, and it never would have been possible without the kindness of this woman, made possible by connections we never would have dreamed possible in years past. The story has another chapter, in the same place, although on a more somber day. In the spring of this year, we were again traveling through the area of North Carolina where they all live, a place dear to my heart. My uncle was by this time in the last days of his life, at home surrounded by his family. Not wanting to intrude on his family, we made arrangements to meet Virginia and her husband, Danny, at my late grandparents’ church, a beautiful little church at a country crossroads. We had breakfast at a nearby cafe, explored the church cemetery where my grandparents, great-grandmother, and other relatives of ours are buried, and even drove down the road to another cemetery close by where my paternal great-grandparents are buried. We talked family history, and life, and got to know each other a little more as we spent the morning together. Our visit together came to an end all too soon. As we were getting ready to leave, she handed us some delicious homemade pumpkin bread, a jar of her Grape Hull Preserves, and a few bottles of North Carolina muscadine and blueberry juices to take along with us, which we savored for days. Once again, she made another difficult day much easier for us, and gave us good memories to replace the sad ones of that day. I received news that my uncle had passed away early the next morning. All of this, because of one small connection which led me to discovering Virginia. I am not sure anyone has ever really asked me why I love it, but anyone around me knows that I am passionate about genealogy. I am not even sure that I can put into words why I work such long, hard hours chasing names on paper, or websites, or what thrills me about finally finding an old photo to put with a name, or actually getting to go visit an old cemetery and see where one of our ancestors is buried beneath that old headstone, which at times are barely readable and often in disrepair. Or, how exciting it is to read a story, see a record, or info other than just the name and date of birth or death, about that ancestor. I started my research in earnest over thirty years ago, when I first got married to my husband, and we started digging for info on both families. My mom was very interested in it, and my dad and sister had done some research in my dad’s birth state years ago. My husband’s aunt also had a lot of information in their family bible, and I started copying all of that down and transferring it to PAF, and my filing cabinet began filling up. I was hooked and I’ve never turned back, or lost interest. At times there are more pressing things at hand with the live persons in my life, raising kids, retiring and starting a new job with the hubby, than chasing the dead relatives, but I always return to my passion of researching our family history. These last few years have gotten even more exciting with all of the technology and information available more readily to researchers. This last year, through Ancestry.com member connect, I met a second cousin who has since become a dear friend to me. We have even met up in North Carolina twice now, and a few weeks ago were exploring our family’s history together as we walked around some cemeteries together. It doesn’t get any better than that! These are the things that keep the genealogy spark lit in me as I piece together our family quilt in this wonderful world of genealogy. Welcome to my blog. I love genealogy, and discovering everything I can about our family’s ancestry. This is my first blog, so I hope to learn as I go, and pass along my knowledge and experiences to others interested in discovering their family’s history. So, let’s see what we can uncover from the past as I stitch our family history into a beautiful and vibrant quilt of ancestors! Welcome to the Taxation Division Blog. Follow our blog by email and you’ll get to see “What’s New” in Taxation. Families are like quilts, stitched together one piece at a time, and the quilt tells a story, one piece at a time.